Cordy Ryman, Strange-Fall, 2017, acrylic, enamel on wood, 40 x 40 x 2.75 inches. Note: This essay, written by artist and art writer Thomas Micchelli, originally appeared in the catalogue for “Free Fall,” Cordy Roman‘s 2017 solo show at Tower 49 Gallery. The eight-foot-long two-by-fours cascade down the wall from the farthest corner of Cordy Ryman’s double-height Sunset Park studio: wooden lengths in forest green, yellow green, emerald green, with stripes of electric orange and fluorescent pink running along their grooved sides and notched edges. Descending from right to left in stepwise diagonals, Ryman’s enormous work, as suggested by its title, Lightning Vines (2017), evokes lightning bolts, vines and tendrils, as well as insect legs and the contour lines of topographical maps. It also recalls the pattern of lines in Marcel Duchamp’s Network of Stoppages (1914), a large painting in oil and pencil in the collection of New York’s Museum of Modern Art. Based on the disjunction between measurement and randomness, Duchamp’s Network of Stoppages is the inverse of Ryman’s network of timber, with its starting point at the bottom right corner of the canvas instead of the top right corner of the room. But the resemblance — unintentional on the part of the artist — is uncanny, as is the process that Duchamp followed in the painting’s evolution, which had its source, as is the case with much of Ryman’s output, in an earlier work. Cordy Ryman, installation view, Lightning Vines, 2017. It may seen counterintuitive to pair Ryman’s physical labor and hard, heavy materials with the cerebral strategies of the founding father of conceptual art, but that would ignore the central tenet of Duchamp’s legacy, and how deeply that legacy influenced the work of Robert Rauschenberg or Jasper Johns, whose dictum of “Take an object / Do something to it / Do something else to it. [Repeat. ]” can be seen as Ryman’s stock-in-trade. I think one of the most important elements [of Duchamp’s influence] is this attitude of complete freedom: freedom from tradition, freedom from dogmas of any kind. And the way he took nothing for granted. He spoke about how he doubted everything and, in doubting everything, found ways to come up with something new. This has certainly been a big part of his legacy: this need, this passion to question everything, even the very nature of art. The real point of the readymades was to deny the possibility of defining art. Art can be anything. It isn’t an object or even an image, it’s an activity of the spirit. Reality and abstraction; art and anti-art; process and object: distinctions that are all but obliterated in Ryman’s practice. What is consistent throughout the manifold objects gliding through his improvisational slipstream — structures small enough to hold in the palm of your hand and large enough to bury you without a trace — is “this attitude of complete freedom: freedom from tradition, freedom from dogmas of any kind,” and the sense that there is an overriding, comprehensive concept, like Duchamp’s Large Glass, at work. As roughshod as it looks, Ryman’s art is as rigorously interrogated as anything that flowed from Duchamp’s chess master’s mind. Nothing is wasted; everything is connected. Cuttings left over from one piece become the genesis of another. Artworks cycle through his studio, completed and sold or returned and reused, living organ donors whose parts become others’ wholes, like the warriors sprouting from dragon’s teeth sown by Jason in his quest for the Golden Fleece. Cordy, Ryman, 8, 2016, acrylic and graphite on wood, 16 x 12 x 3.5 inches. Cordy Ryman, Blue Mission, 2016, acrylic, acrylic and enamel on wood, 13 x 12 x 4.5 inches. Grey Thumb Table, 2015, acrylic, enamel, ink and color pencil on wood, 9 x 7.25 x 4.75 inches. 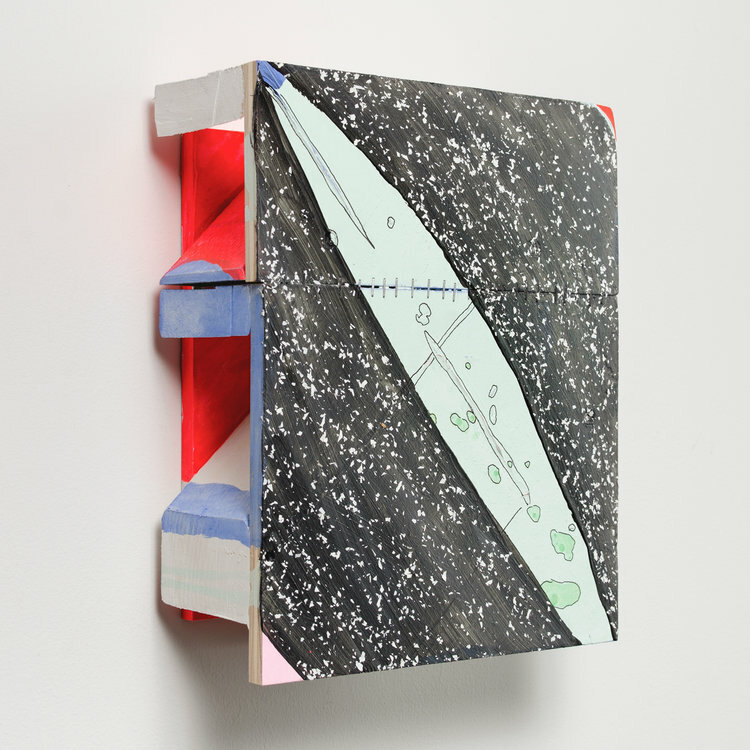 Cordy Ryman, Composition Split, 2016, acrylic, enamel, ink, staples on wood, 12.75 x 10 x 4.5 inches. 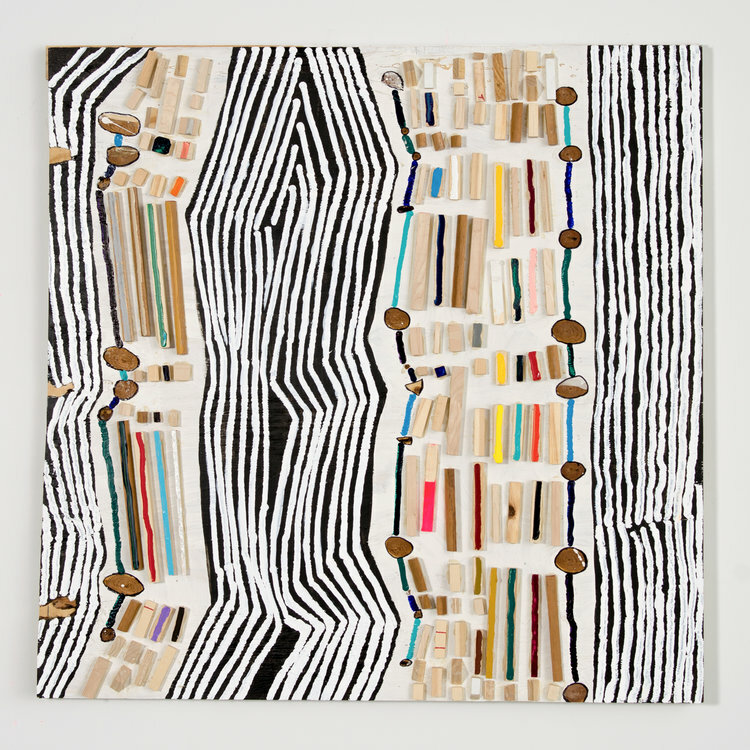 Cordy Ryman, Clipper, 2016, acrylic and enamel on wood, 48.25 x 48.25 x 2 inches. Cordy Ryman, Chop Sticks, 2016, acrylic, enamel on wood, 13 x 14 x 2 inches. 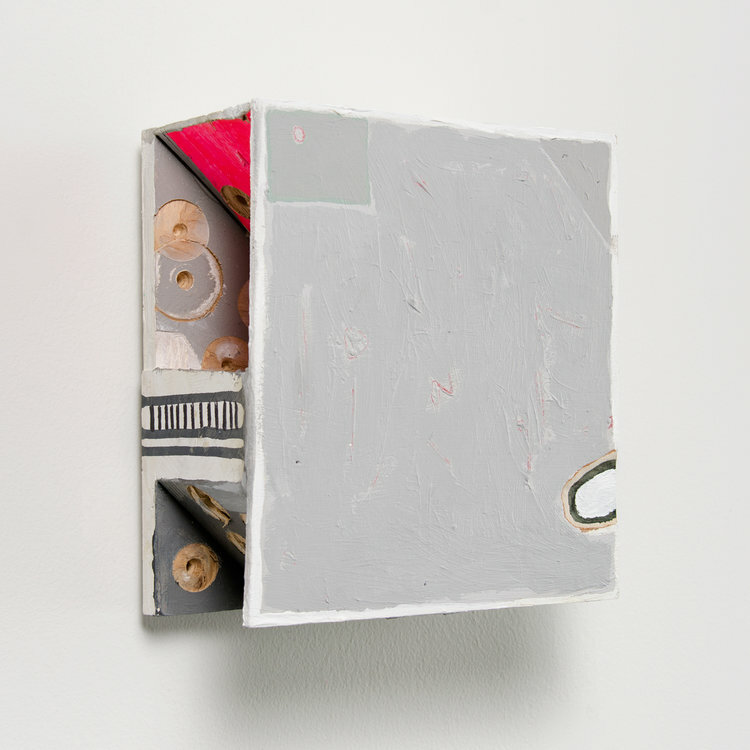 Cordy Ryman, Candy Box, 2016, acrylic on wood, 7 x 6.25 x .75 inches. 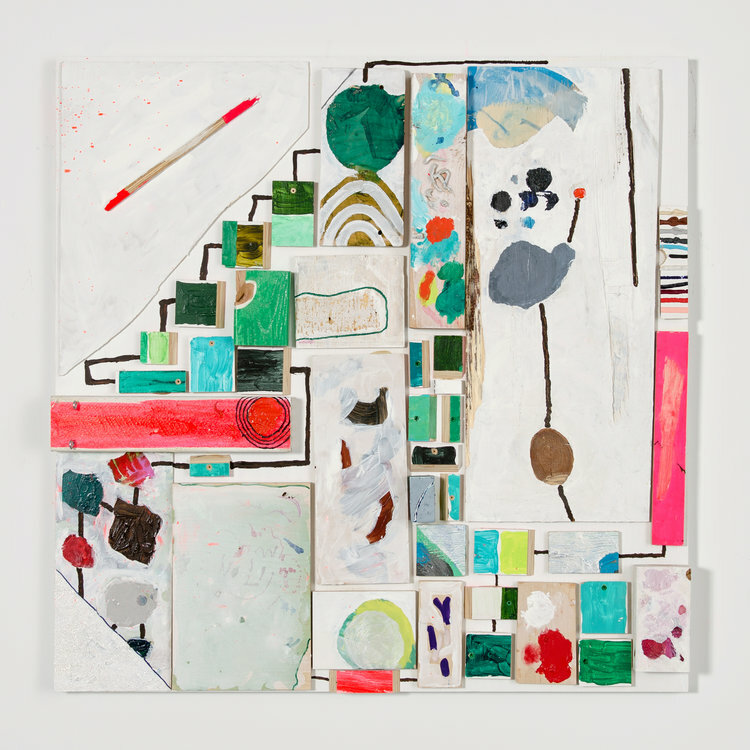 Cordy Ryman, BQE, 2016 acrylic, enamel and mixed media on wood 48 x 48 x 2 inches. Cordy Ryman, Art Cake, 2016, acrylic, enamel and mixed media on wood, 48 x 48.5 x 2.5 inches. 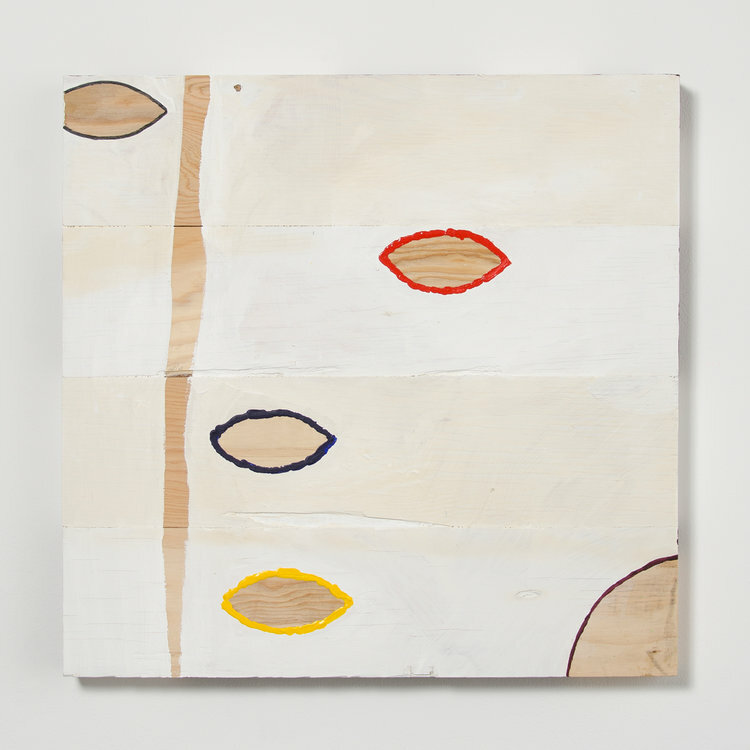 Almond Mask, 2016, acrylic and shellac on wood, 20.5 x 21 x 1.5 inches. Ryman’s artworks are their own readymades, a paradox of action and being. Duchamp’s bicycle wheel (1913), bottle rack (1914), and urinal (1917) were not merely spitballs in Western Civilization’s eye (a critique made all the more pointed by the apocalyptic crackup of World War I), but also steel hinges between the domains of art and life. While Picasso and Braque were exploding genre retreads (the portrait, landscape, and still life) into Cubist facets, flirting with abstraction even as their collages incorporated swatches of the everyday, Duchamp was taking direct aim at hard reality, eliminating the difference between art and the actual through the fiat of the artist’s intent. The painted sculpture and sculpted paintings of Cordy Ryman refuse to disguise their source in the scrap heap, wearing their hardware, glue, and wood knots as badges of honor. They simultaneously embrace and refute abstraction, engaging in the playfulness and formal Platonism indulged by the Cubists while maintaining a Dadaist’s intimate relationship with unrefined reality. This marriage of opposites can freight the work with an anxiety that, like Cubism, like Dada, matches the time in which it was created; as world events have spun increasingly out of control, the truth of Ryman’s objects seem to reside in their inherent fractiousness. The artist not so much cedes control over the object but acknowledges the impact on that object by forces outside of his control. The compositional pattern of a wall relief is determined by the wood grain of the blocks assembled to create it; a painting’s shapes follow the contours of scraps pressed in a tightly fitted configuration onto the surface; another surface is made up of the narrow sides of vertically laminated two-by-fours, the upper portion painted white while the lower section is left bare. Ideas alight from anywhere. 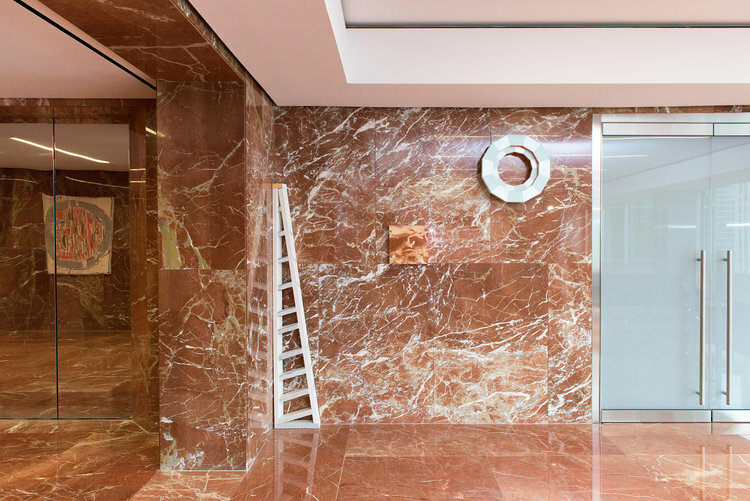 As part of his preparations for this show, Ryman asked a colleague, Justin Natividad, to create a painted mockup of the red marble walls lining the Tower 49 lobby in order to judge which of the smaller pieces would work against such an intense backdrop and which would not. But in a telling demonstration of the fluidity of object, illusion, reality, and intent, Natividad’s marbleized panels achieved a second life when Ryman decided to cut them up and hang them against the stone as illusionistic near-matches, titling them collectively Jupiter (2017) for their resemblance to the giant planet’s Great Red Spot. Freewheeling improvisations like this one can be startling to the viewer, but they follow the same internal logic that leads the artist from one idea to another and another: examining his source materials; selecting an object for development; doing something to it; doing something else to it. They also beg the question of how the artist conceives of projects such as Lightning Vines, which radiates — in a mirrored version of the studio prototype — from opposite corners of the East Lobby, and Root Vines (2017) — the forest of hinged two-by-fours hanging against the north and south sides of the elevator core — that exceed his physical grasp: are the essential elements of flux and impulse still at play? The immense scale of such installations — and Lightning Vines is the largest Ryman has ever attempted — transfer the practice of improvisation from the physical realm to the conceptual. Both sets of elements have been used before in different contexts: the three shades of green appeared in Green Wave (2007), an installation of dozens of wood strips undulating across the corner walls of the Nerman Museum of Contemporary Art in Overland, Kansas, while the hinged planks clustered against the elevator core were last seen at the Zürcher Gallery in New York City as part of a solo exhibition in the fall of 2016. 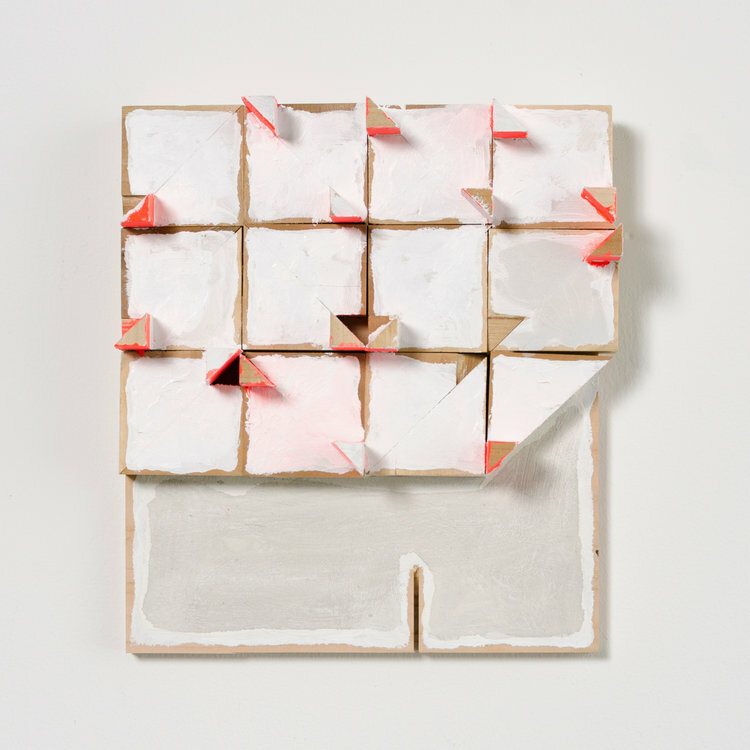 These earlier iterations are imaginatively picked apart and reassembled within the same ideational flow that triggers the physical manipulation of paint, fasteners, adhesives, and wood chunks in the smaller-scaled objects. For Lightning Vines, the undulating wave of green timber presented in Kansas has been swept off the floor and strung up near the ceiling, where it begins its herky-jerky descent to the floor. The hinged wooden strips from the Zürcher show — which curved precipitously at the top and bottom, like a mammoth white ribcage, in installations called Melville and Whalebones (both 2016) — are transported in Root Vines from the mammalian to the botanical (the title comes from the artist’s comparison of the vertical studs to the exposed “roots of the building”). Lightning Vines and Root Vines — the green, spidery reticulum dangling from the lobby’s upper reaches, and the variously colored planks plunging from the ceiling and striking the floor — embody a powerful downward thrust. They are both emblematic of an artist letting go of prior constructs, with their implicit constraints on the imagination, and free falling through the exponential variations of the possible. Every tangible manifestation that appears along the way — whatever ends up sawed, glued, hinged, and painted — is yet another state of being for an ever-evolving array of elements. The magnetism exerted by Ryman’s art is derived from its persistent identification with the functional reality of those elements — the physical trail of the conceptual engine driving the process. His work encompasses a cleaving of the material and immaterial — encapsulated by the title Lightning Vines — into an earthbound metaphysics in which the unyielding solidity of his lumber and hardware amounts to a testament to impermanence and change — the continual breakdown, buildup, and breakdown of whatever we attempt to hold onto. It is not an art of assurance. It’s a phantasm flickering in a windstorm. “Cordy Ryman: Free Fall,” curated by Thomas Michelli. Tower 49 Gallery, Midtown, NY. Through May 2018. Opening reception: Monday, May 15, 5:30–8:00pm. About the author: Thomas Micchelli is an artist, writer and co-editor of Hyperallergic Weekend. His paintings and drawings have been exhibited at John Davis Gallery in Hudson, New York; Life on Mars, Outlet, Norte Maar, Studio 10, Centotto, and Schema Projects, all in Bushwick, Brooklyn; and Leslie Heller Workspace in Manhattan. Ryman, Cordy. Personal interview. February 28, 2017. Tomkins, Calvin. Marcel Duchamp: The Afternoon Interviews. Brooklyn, NY: Badlands Unlimited, 2013. Interview with Calvin Tomkins by Paul Chan. Ryman, Cordy. Personal interview. January 19, 2017. Museum of Modern Art. “Marcel Duchamp, Network of Stoppages.” moma.org. 2017. Accessed March 27, 2017. https://www.moma.org/collection/works/79600.